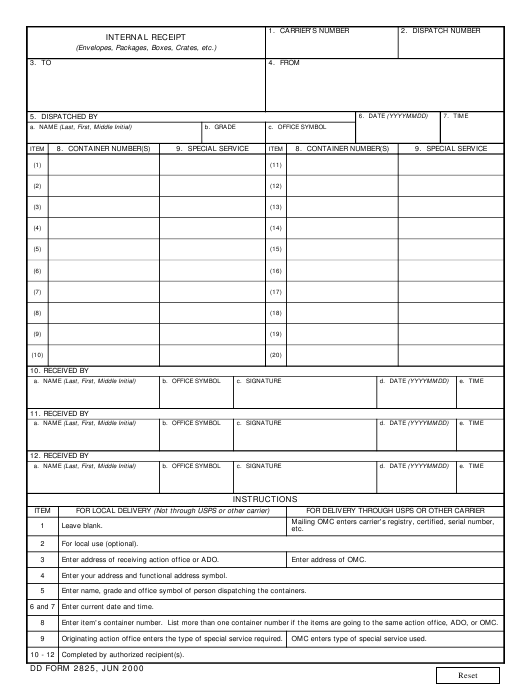 DD Form 2825 - also known as the "Internal Receipt" - is a United States Military form issued by the Department of Defense. The form - often incorrectly referred to as the DA form 2825 - was last revised on June 1, 2000. Download an up-to-date fillable PDF version of the DD 2825 below or request a copy through the chain of command. Enter address of receiving action office or ADO. Enter your address and functional address symbol. Enter name, grade and office symbol of person dispatching the containers. 6 and 7 Enter current date and time. Enter item's container number. List more than one container number if the items are going to the same action office, ADO, or OMC. Originating action office enters the type of special service required. OMC enters type of special service used. 10 - 12 Completed by authorized recipient(s).